Home decor doesn’t have to break the bank. When decorating your home, The Dollar Tree can quickly become a place to remedy sky-high name brand prices. Creating knock-off name brand decor has never been easier! With an entire craft and garden section, the possibilities are endless. 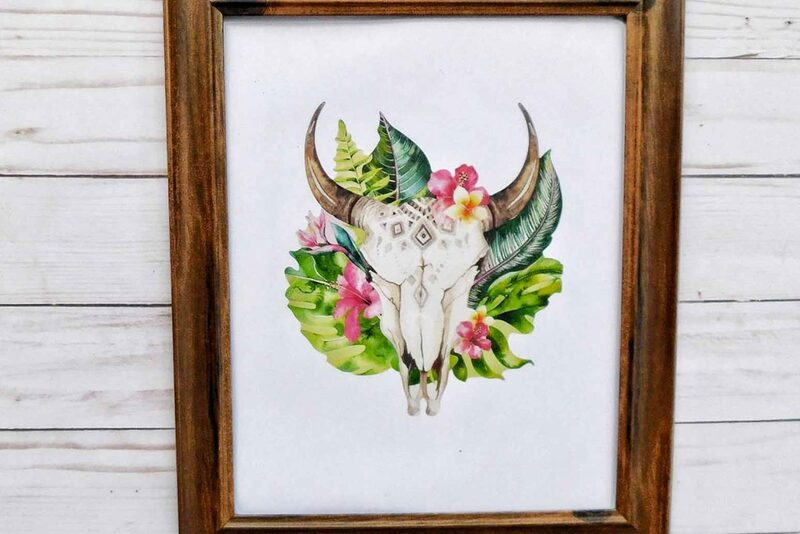 Boho chic wall art is on trend. With the average price of framed wall art ranging from $5-$50, you’ll be happy to discover that you can create your own for only $2! To create your own Dollar Store Faux Print Art, follow the tutorial below. When most people think of DIY projects, they may be misled to believe that inexpensive materials means it looks cheap. But that myth is quickly busted with this dollar store faux print tutorial. Create your very own professional looking faux print wall decor with a few simple items from your local dollar store. First, lay out your materials on a clean workspace, table, or counter. Take your dollar store picture frame and disassemble it. Place the back of your frame on top of your sheet of white paper. Then, trace your frame back on your white paper. Using scissors, cut your paper along the traced lines. Next, take your decal and peel it off. Make sure to peel carefully to prevent ripping the decal. Then, take your decal and place it on the center of your white piece of paper. Smooth it out as you adhere it to the paper to prevent any bubbling. Place your paper with the decal into your picture frame and hang! And that’s all. No mess, no fuss, and best of all, less than $5. Check out this new episode from This Grit and Grace Life podcast, Miss Independent: Can You Be Healthy, Strong and Dependent? – 047! You’ll also like 5 Things Everyone Should Buy at the Dollar Tree, How to Make a DIY Nautical Mason Jar In 10 Minutes, Why Succulents Make a Great Member of the Family, You Are 15 Minutes Away from a Better Day, 10 Tips for Cheap DIY Summer Fun, and The Perfect Blended Mocha Recipe That Will Help Save You Money.